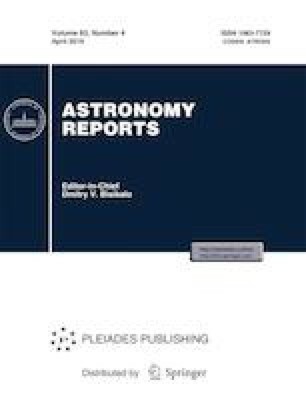 The results of observations of the blazar J1504+1029 (PKS 1502+106, OR 103), obtained in 2000–2018 on the RATAN-600 radio telescope of the Special Astrophysical Observatory at 2.3, 3.9 (4.7), 7.7 (8.2), 11.2, and 21.7 GHz and on the 32-m Zelenchuk and Badary radio telescopes of the Quasar-KVO complex of the Institute of Applied Astronomy of the Russian Academy of Sciences at 5.05 and 8.63 GHz are presented. The long-term variability is studied, as well as variability on time scales from several days to several weeks and intraday variability (IDV). The long-term light curves are correlated at all frequencies and show continuous activity, against which three flares with their maxima in 2002, 2009, and 2018 are distinguished. The time scale for variability of the flare in 2009 is τvar ≈ 1 year. At 21.7 GHz, the linear size of the emitting region is R ≤ 0.3 pc, its angular size is θ ≤ 0.05 mas, its brightness temperature is Tb ≥ 2 × 1014 K, and the Doppler factor is δ ≥ 5.8. The flare with its maximum in 2018 has a long rising branch at 21.7 GHz: τvar = 3.2 years, linear size R ≤ 1.1 pc, angular size θ ≤ 0.17 μas, brightness temperature Tb ≥ 2.2 × 1012 K, and Doppler factor δ ≥ 2.8. Among eleven sets of daily observations of the source over 75–120 days in 2000–2017, variability was detected in eight data sets at two to four frequencies with characteristic time scales of 4–30 days. In seven data sets, the variability is due to one to three cyclic processes with characteristic time scales τacf = 4−30d. The spectral indices of the variable components in different years vary from αvar = −1.6 to +1.8. In at least four data sets, the variability is due to processes in the source itself. In this case, at 21.7 GHz, the apparent linear size of the emitting region is ≤4000 AU, the angular size is θ ≤ 3.5 μas, the brightness temperature is Tb ≥ 3 × 1014 K, and the Doppler factor is δ ≥ 14. In the 2004 data set, the variability has an “ anti-flare” form, with the flux density of the variable component falling at high frequencies. Thirty-six successful sessions were conducted on the 32-m telescopes at 8.63 GHz, and 16 at 5.05 GHz. IDV was detected in 17 sessions at 8.63 GHz and in three sessions at 5.05 GHz, with the IDV being detected mainly near flare maxima. Russian Text © V.K. Konnikova, M.A. Kharinov, A.V. Ipatov, I.A. Ipatova, V.V. Mardyshkin, M.G. Mingaliev, 2019, published in Astronomicheskii Zhurnal, 2019, Vol. 96, No. 4, pp. 311–338.